The German Shepherd dog is famous for her role as a military and police dog, but she is also famous for her fabulous coat—with the help of the best brush for German Shepherds. Thick, dense and weather resistant, the German Shepherd requires plenty of upkeep in order to keep her coat and skin healthy. Part of a proper grooming routine for your German Shepherd means understanding her coat and having the right tools on hand. Let’s discuss grooming for German Shepherds. Do German Shepherd Dogs Need Brushing? German Shepherds absolutely need brushing, and they need brushing quite often. There are a number of different brushing tools you will need for your German Shepherd because her coat is incredibly thick and sheds profusely. The type of fur your German Shepherd has, as well as her temperament, personality and lifestyle will all play a role in how often you should brush her. What Types of Fur Do German Shepherd Dogs Have? As we learned above, German Shepherds have incredibly thick, double-layer coats that shed year around. In fact, German Shepherds “blow” their fur, even more, twice a year, during spring and fall months, although some can shed profusely all year in warmer climates. German Shepherds need a consistent amount of brushing and maintenance to keep their coats vibrant, as well as maintain a healthy immune system. In fact, neglecting to properly brush and groom your German Shepherd could lead to skin infections, sickness and more. How Often Should You Brush a German Shepherd Dog? German Shepherds are particularly active dogs who are known for their intelligence, loyalty and love for adventure. This breed is very high energy and will likely spend a lot of time outdoors. There is a pretty good chance your German Shepherd will leave home clean and come back messy. Luckily, bathing your German Shepherd is only required every four to five months. The natural oils in her skin will help to keep her hair and skin moisturized and healthy. Still, brushing her is required almost daily, depending on her activity level. Brushing your German Shepherd removes dirt and debris. This is also an opportunity for you to check for damaged skin or hot spots that may have otherwise gone unnoticed. But what are some of the best brushes for a German Shepherd? German Shepherd owners require a few different kinds of brushes and combs in order to help maintain their dogs’ coats. A slicker brush helps get the loose hair, dirt and debris on the surface of your dog’s coat. It also leaves the coat shiny. An undercoat rake or a de-shedding comb helps to dig deep down through your dog’s double layer of fur. It gets to the root, where old, dead hairs can get caught and cause matting and infection. We have listed a few of our favorite tools for brushing a German Shepherd dog, with the first being the MIU COLOR Dog Deshedding Toll and Grooming Brush. This is a best seller with over 2,000 customer reviews and a 4.5-five star rating. It is recommended by veterinarians and groomers alike. This brush removes loose hair while promoting skin and fur growth by stimulating blood circulation. We also think your German Shepherd will love the PawsPamper Extra Wide Undercoat Rake for Medium to Large Dogs. This heavy-duty de-shedding tool that helps penetrate your German Shepherd’s thick fur. The rake gets to the root without harming her or causing any pain during brushing. An excellent choice if your German Shepherd tends to mat easily, it helps to detangle while leaving your dog’s fur healthy and shiny. Then there is the FURminator De-Shedding Tool for Dogs. This is another best-selling item that boasts over 13,000 customer reviews and nearly 5 stars. This tool gets past the top coat and penetrates the bottom to get out all the loose hairs. It is also easy to clean, with a button to easily eject loose fur so you can keep on brushing. And when talking about self-cleaning brushes, we can’t leave out the Hertzko Self Cleaning Slicker Brush. Helping to gently remove mats and tangles, this slicker brush improves blood circulation and keeps your German Shepherd’s skin safe from scratches or abrasions during brushing. Because this brush is self-cleaning and ejects loose hair, you don’t have to stop to clean it in the middle of your grooming routine. Speaking of your grooming routine, let’s talk about how to properly brush a German Shepherd. German Shepherds are large, powerful and highly intelligent dogs. You want to approach your grooming routine with them using positive reinforcement and patience. This is especially important considering your German Shepherd needs to be brushed anywhere from daily to four days per week, depending on her activity level. Many groomers and German Shepherd experts suggest acclimating your German Shepherd to the brushing process by beginning when she is a very young puppy. Keep in mind that the brushing process can also get messy, especially during shedding season, due to the amount a German Shepherd sheds. So, if at all possible, try to brush her somewhere where cleanup will be easy. On a daily basis, you can use most slicker brushes to brush your German Shepherd quickly. Doing this routinely will help to eliminate loose hair from floating around your home and clothes while keeping her skin and coat healthy. During shedding season, you need your slicker brush and de-shedding rake. Whenever you brush your German Shepherd, begin at her head with the slicker brush and go from head to tail. If it is shedding season, use a rake comb first and then use the slicker brush. Don’t be surprised if you get handfuls or even bagfuls of hair. When brushing your German Shepherd, make sure that you keep an eye out for any scrapes, bumps or cuts. This is one of the best times to look out for these injuries or issues. One of the best tools you can use for parting your German Shepherd’s hair to inspect any areas for abrasions would be the raking comb. This comb, with its fine wires, makes parting your German Shepherd’s thick fur easier. Remember to be gentle with your German Shepherd. Never encounter tangles with a rough hand. Work on mats patiently until they are detangled. Offer your German Shepherd loads of praise and even treats if she seems uncomfortable. If your German Shepherd is particularly prone to mats, you may want to consider investing in a high-quality dog conditioning spray to help detangle stubborn knots. Many groomers also suggest brushing your German Shepherd using the same process every time. This way, she will know what to expect and will likely be more relaxed during the process. We know that the idea of brushing your German Shepherd can be daunting, especially seeing it in writing. That’s why we offer you a video of a professional German Shepherd expert. Pay attention as he recommends brushes and shows you how to best brush your German Shepherd properly. Brushes aren’t the only things that you’ll need to get for your German Shepherd! Let’s look at some other products and accessories you might want to get for your new pup. Brushing your German Shepherd consistently is one of the most beneficial ways you can help to keep his skin and coat vibrant. This leaves his immune system thriving. 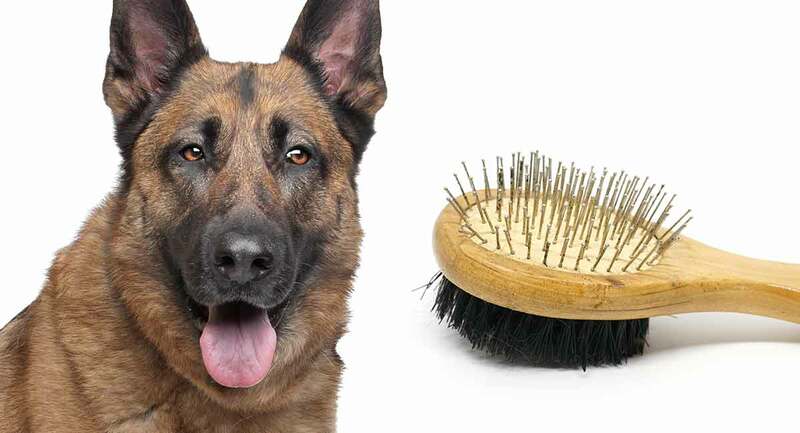 You need a few special tools to properly brush your German Shepherd dog, including a slicker brush and a raking comb. Both will help to adequately remove loose hair, debris and dirt. This helps you keep an eye out for any sores, scrapes or bumps on your German Shepherd’s skin. Enjoy your time grooming your German Shepherd dog. Brushing her is an excellent way for the two of you to spend some good, quality bonding time together.